Preheat oven to 350°. In a large bowl, combine cake mix, flour, pudding mix and cocoa. In another bowl, whisk milk, oil, butter and 1 egg until blended. Add to dry ingredients; stir just until moistened. Press half of the mixture into a greased 15x10x1-in. baking pan. Bake 10 minutes. Meanwhile, chop two candy bars. Stir peanut butter, vanilla and remaining egg into remaining cake mix mixture. Fold in chopped bars and 1 cup chocolate chips. 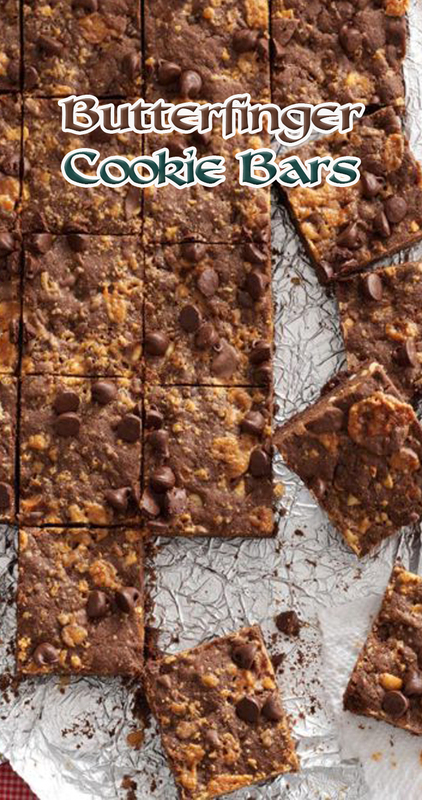 Chop three additional candy bars; sprinkle over warm crust and press down gently. Cover with cake mix mixture; press down firmly with a metal spatula. Crush remaining candy bar; sprinkle crushed bar and remaining chocolate chips over top. Bake 25-30 minutes or until a toothpick inserted in center comes out clean. Cool on a wire rack. Cut into bars. Store in an airtight container.